Istanbul (AFP) - Senol Gunes, the coach of Turkish top flight side Besiktas, was hospitalised on Thursday after being hit on the head by a projectile apparently thrown from the crowd in an away game at arch Istanbul rivals Fenerbahce. The match, the second leg of a Turkish Cup semi-final tie, was abandoned in chaos in the 57th minute after the incident, the latest burst of crowd trouble to hit Turkish football. Turkish television pictures showed Gunes clutching his head in pain and bewilderment and falling to the turf after being hit by the projectile, which has yet to be identified. Gunes, the legendary former Turkish international goalkeeper who has led Besiktas to two consecutive championship titles, was taken by his own medical staff to the changing rooms where he received five stitches to the head wound. He was later taken to hospital and pictures showed him being transferred on a stretcher. It was not immediately clear when he would be allowed to go home. At the time the match was abandoned at Fenerbahce's stadium on the Asian side of Istanbul, the score was 0-0 (2-2 on aggregate). 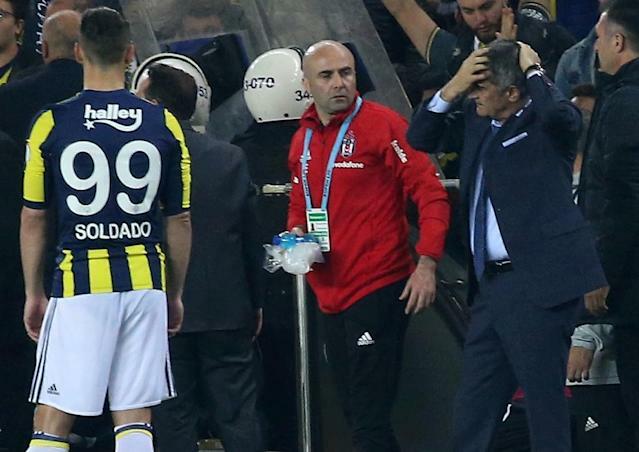 The incident happened after a row erupted between Fenerbahce fans and Besiktas players on the bench. Reports said that the Turkish Football Federation (TFF) would later take a decision over the outcome of the match, which may now be replayed. The match had already been halted for five minutes in the first half when projectiles where thrown at Besiktas players. Tempers had flared when Besiktas' star Portuguese defender Pepe was sent off for an ill-judged tackle. Istanbul derbies represent some of the most intense football matches in Europe and the clash between Besiktas and Fenerbahce in September was marked by five red cards and 12 yellows. The incident adds to tensions as the Turkish league season heads to its climax, with all four big Istanbul sides -- Besiktas, Fenerbahce, Galatasaray and Basaksehir -- all in contention for the title.